If you installed SecureDrop before the release of SecureDrop 0.12.0 and have not upgraded to Ubuntu 16.04 yet, you must do so before April 30, 2019. Please see our detailed instructions. If you have not already done so, we recommend that you update all Tails drives to version 3.13, which was released on March 19, 2019. 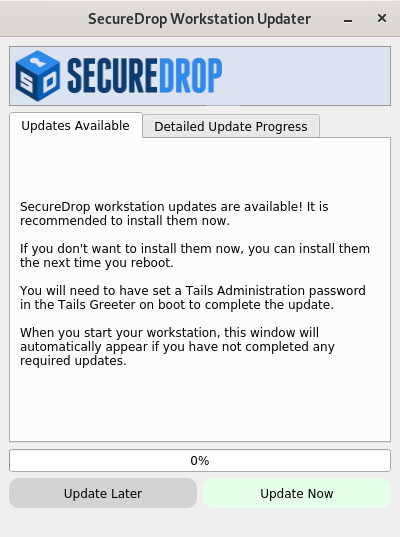 Follow the Tails graphical prompts on your workstations to perform this upgrade. You may have to run the --recv-key command repeatedly for it to work. If you do see the warning “refname ‘0.12.1’ is ambiguous” in the output, we recommend that you contact us immediately at securedrop@freedom.press (GPG encrypted). This release includes important fixes that will make the graphical updater more reliable for future updates.